Finally it had come to pass. The dilapidated house was going to be ours and it was time to hand over our house to its new custodians. To prepare for the first night in our rental home where we would stay while building work was carried out, I had packed an overnight bag for each member of the family. 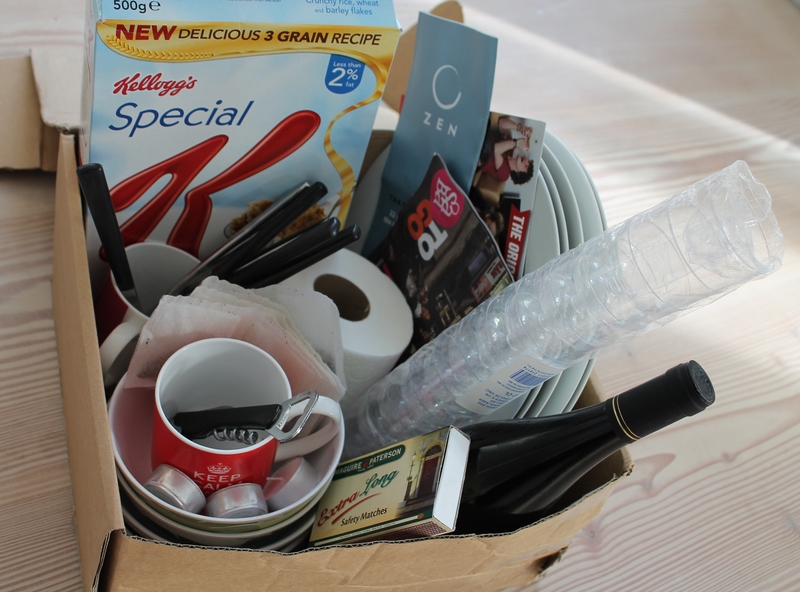 These went into my car along with a box of essential supplies: some plates, glasses, cutlery, take away menus, corkscrew, candles, matches, torch and toilet paper! Some breakfast cereal, tea and coffee were also in there but not the kettle as it is always the last item to be packed: used up to the last minute by the furniture movers! It was time to say goodbye to our home. It had come a long way from a used car lot to a living breathing (dare I say it, award winning architectural home). So many memories. Making snowmen on the lane outside. Birthday parties. Dinner parties. Sunny mornings with the sun beaming through the window as I looked at the spire of the church outside. Warm evenings where we got the very last of the sun on the first floor terrace before it disappeared behind the trees. The kids climbing through the hole in the wall to play with the neighbours. A file had been prepared. The colours used throughout the house had been listed, the outline of the heating system and other essentials was explained. I drew the line at drawing out a plan of the garden, although I really did want to tell the new owners where various items that are buried deep underground at this time of year are located. I wanted to tell them that although the rhubarb looks dead it will come back in abundance next year. I wanted to tell them where the various goldfish and our pet rabbit was buried. It was sparkling clean but the life had been sucked out of it. It proved to me yet again that although the space, the light and the layout are important that it is the combination of all of those together with the interior decor, the personal possessions and the people that go to make up the whole of a family home. So from now on we will store in our heads and our hearts the treasured memories that were created there. It was time for a new adventure. We had finally received the keys to the pigeon house, a two storey over garden level house constructed c 1865. 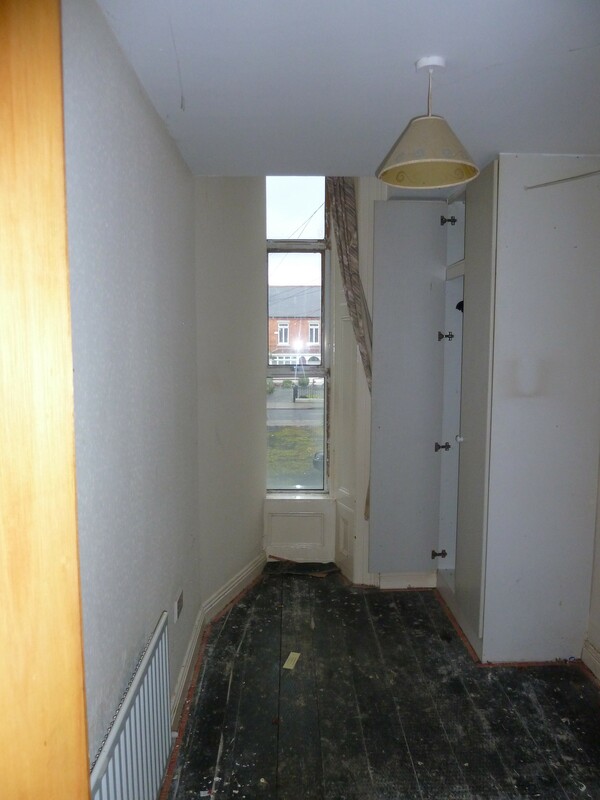 The property was converted into 18 separate flats in the 1960’s but had been derelict for some time (except for the winged occupants who were nesting in the attic and living throughout the house). 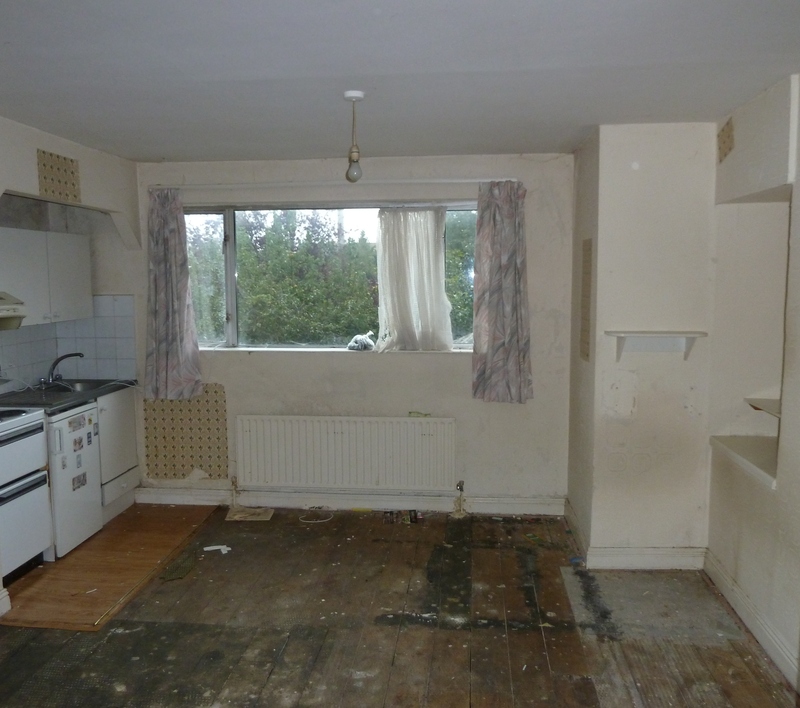 The house was in a serious state of disrepair, having suffered damage from a leaking roof and also from break-ins. 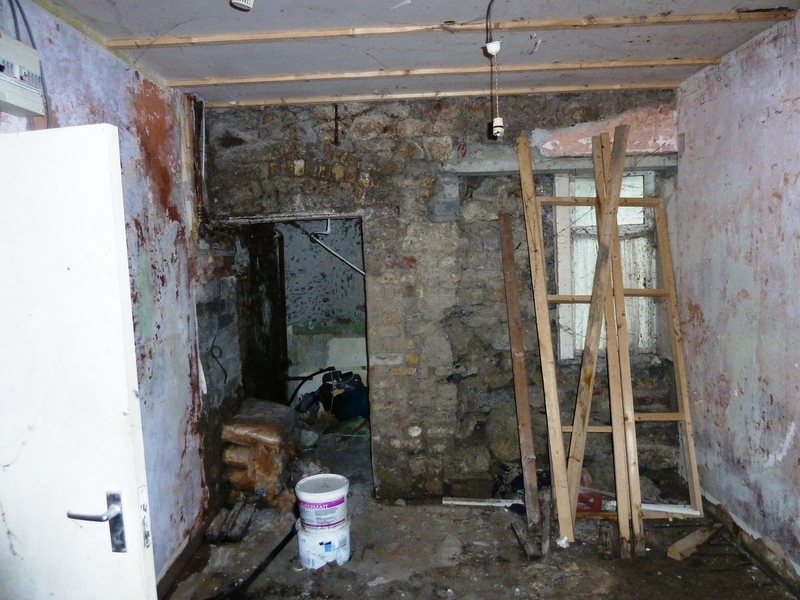 The garden level had been stripped out and some building work commenced but then abandoned. There were some modern extensions to the side and rear that we had never even seen internally. The bundle of keys was huge! We were finally going to see what we had actually bought, so here it is: the pigeon house, as purchased. Inside the front door, approached by external steps was the entrance hall. The stairs between the middle level and first floor remained intact. There was no stairs to the garden level. An external fire escape lead from the rear of the hall. 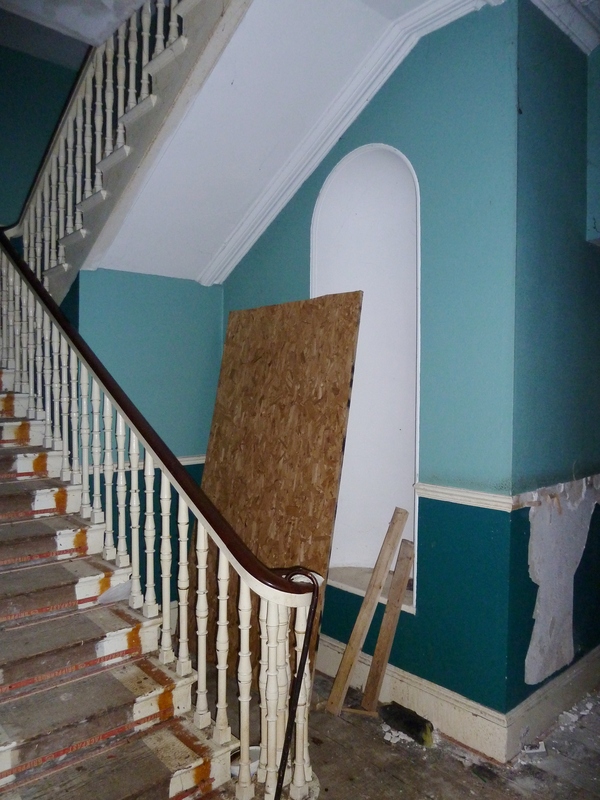 Despite the partition wall created at the end of the entrance hall and the obvious damp and mould coming through the cornicing we could see the potential! Our strategy was to remove the non-original inappropriate alterations and to restore the house to a family home, retaining and protecting from further damage all the remaining architectural features. At lower ground floor level where there were no original features at all remaining we would take a different, contemporary approach. 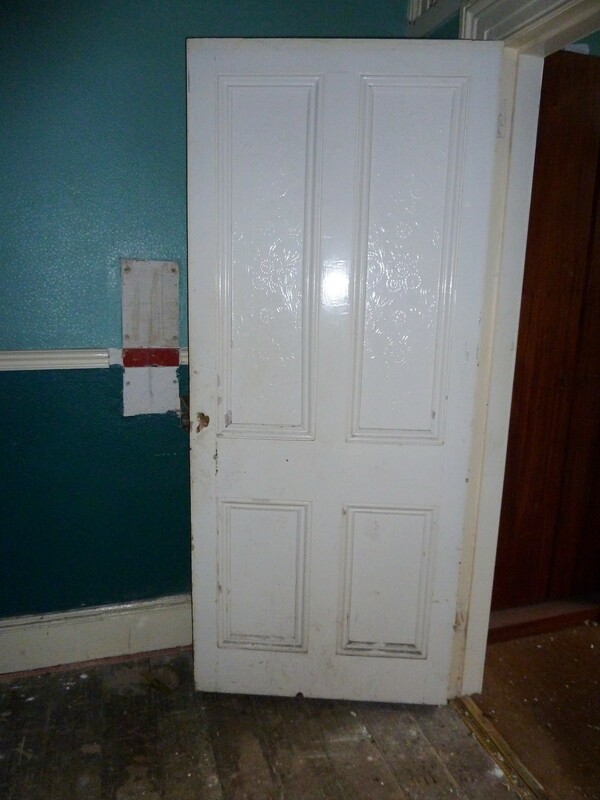 All the original internal doors in the house had been replaced in the 1960’s, except for this one: a four paneled original door and architrave surround. This we would use as a bases for making new doors for the principal rooms, none of which were intact. The rooms would have been large with high ceilings. In order to convert the house into self-contained units, partitions were erected, usually down the centre of windows as seen above, to provide living rooms, bedrooms, bathrooms and kitchen accommodation and the location of internal doors was also altered. Plumbing and wiring was inserted with little or no regard for the original structure or decorative features. This photo shows the other half of the window above. Our plan was to remove the partition and the false ceiling, lowered to conserve heat and reinstate the room to a single entity. 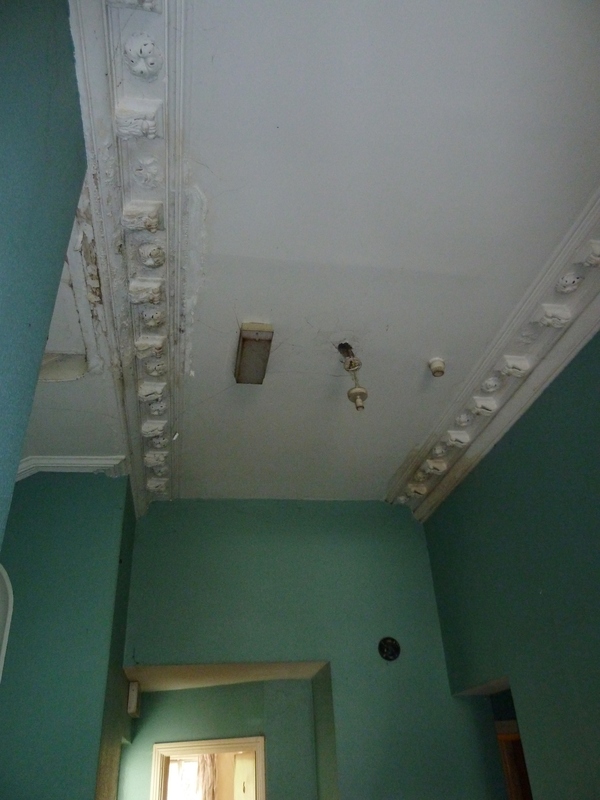 We had no idea yet if there would be original decorative cornices intact. Here you can see the ceiling has been boxed in around the tall window. The original window has been replaced with an aluminium one. This shows one of the many kitchenettes throughout the house as well as the type of internal door that had replaced the original four paneled one seen above. At first floor level the lowered ceiling was in line with the top of the windows. This room was to become my daughter’s bedroom! 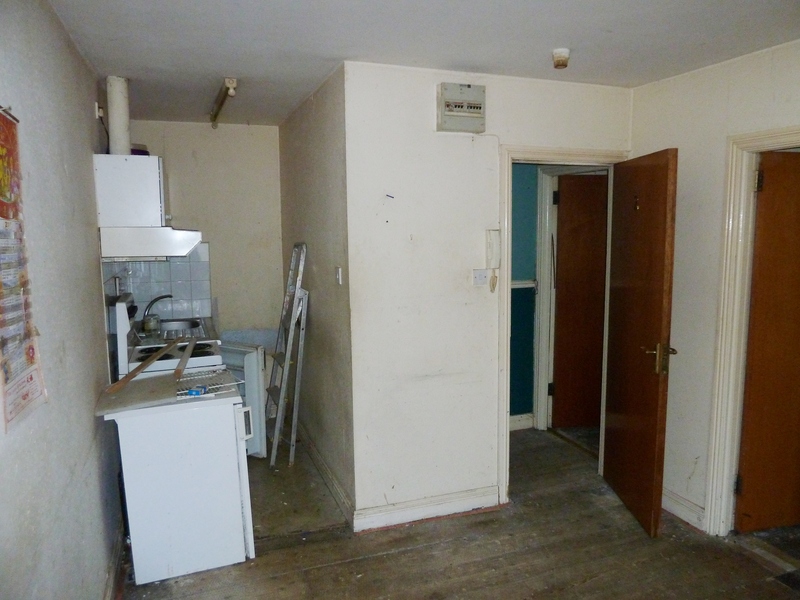 This room was located in a 1960’s extension at the rear of the entrance hall. As it was not part of the original property and there were no period features, we proposed a different approach here to the rest of the house. 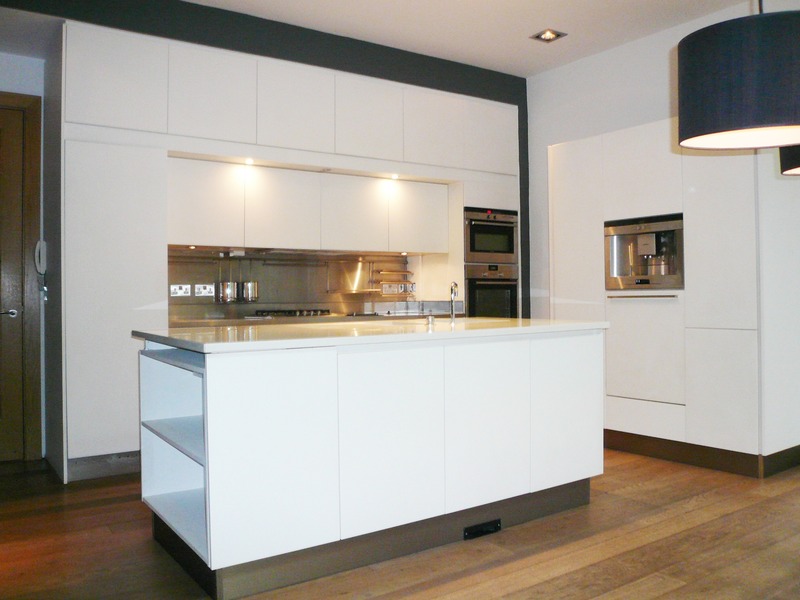 Our plan was to remove the floor of this room entirely to create a double height dining area opening onto the kitchen located at the lower level. We proposed lowering the window to become a glazed screen onto the garden. 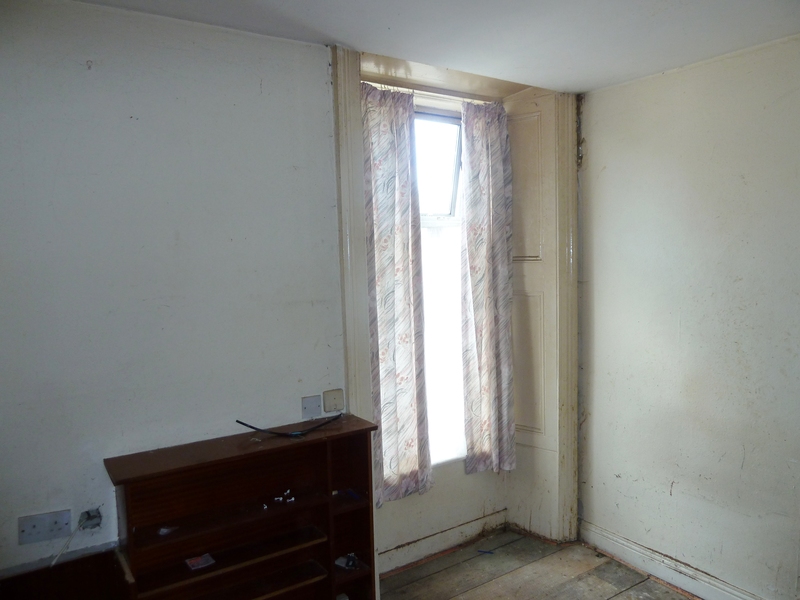 In this, another first floor room, you can see that whilst all the original windows, doors skirting’s, fireplaces had been removed; the shutter boxes surrounding the windows had survived. 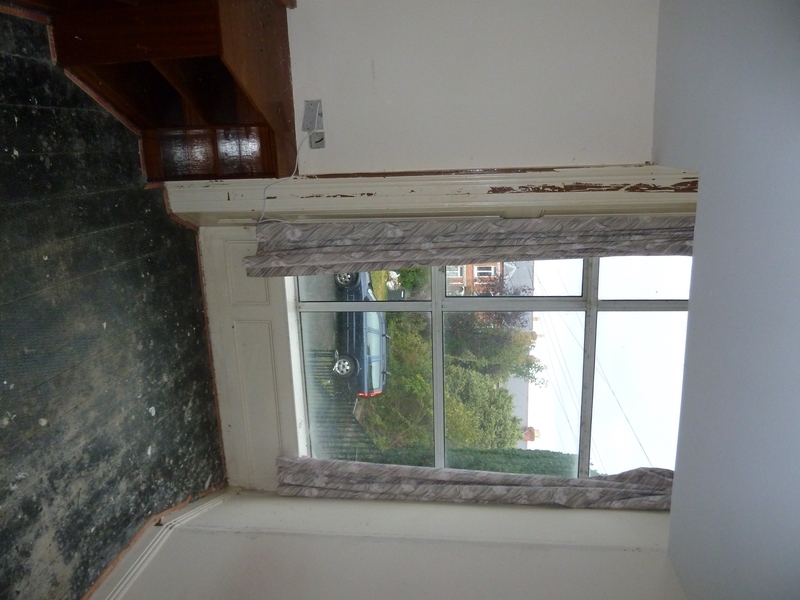 This meant that we could replace the windows with news timber sash windows easily enough. 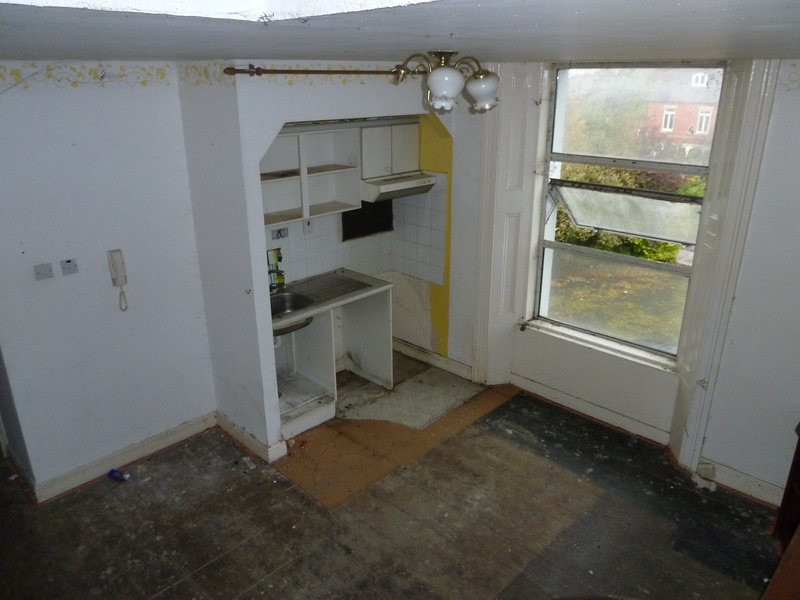 These photos show the lower level in the condition as we bought it. 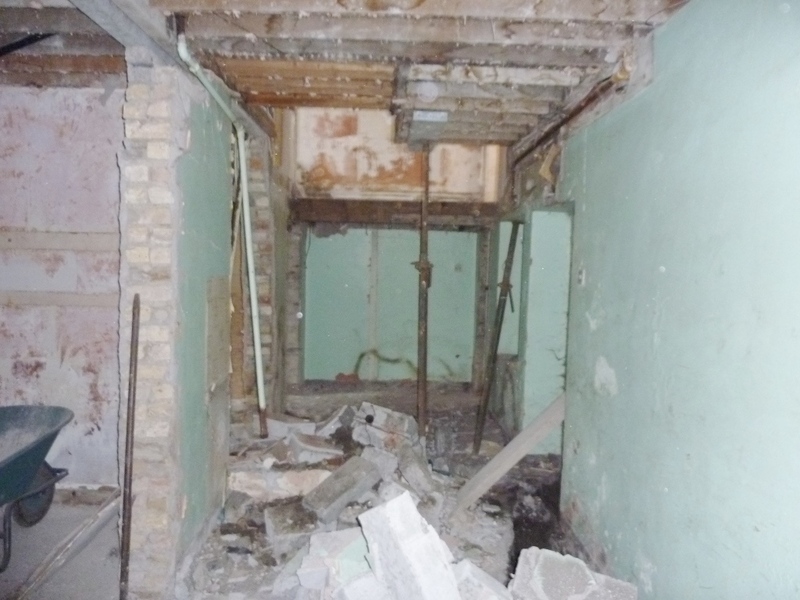 Building work had been commenced before being abandoned, leaving a concrete and rubble shell. A blank canvas to us! Unfortunately what is impossible to convey in a blog is the overwhelming smell of the pigeon debris (guana, to use its technical term) that was prevalent everywhere. Also, the multiple bathrooms, with stagnant water had their own particular aroma, as the property had been broken into many times and used as a drinking venue. (The photos were too grim to show.) My mother-in law (who is pretty hardy!) was determined to see the house in its entirety as purchased. Unfortunately nausea overtook her and she had to leave half way through looking at it. She then a found a small perfume sample in her car and returned when she had doused a tissue with it and held it over her face before returning to continue the “tour”! Planning permission had already been secured so the next task was twofold: secure the roof to make the building water tight and secondly to clear out the debris. This entry was posted in Interior Design, Moving house and tagged architecture, conservation, house potential, moving house, refurbishment by Passionate about Design. Bookmark the permalink. You have your work cut out. I don’t think I would enjoy taking this on. However, I know you guys will do something very special. Will keep you posted with photos of progress Conor. However, It may be a few weeks before I get back to the house story as I am currently getting really into Hallowee’en : the decorations, the food…watch this space! This looks like an amazing project. 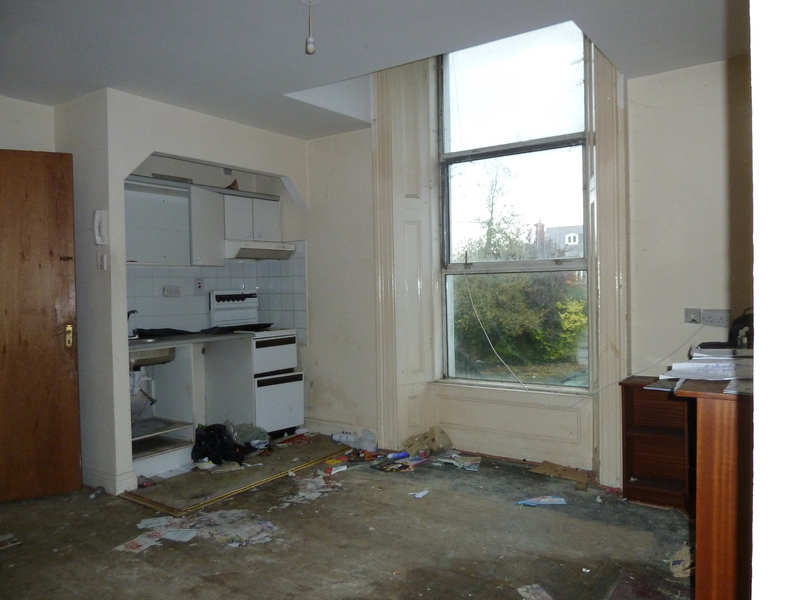 Hoping there are lots of original features for you to discover.